Last week, I wrote that the Yankees should sit Jorge Posada and bring up uber-prospect Jesus Montero to take over the full-time DH role. And I got raked over the coals for it. One week later, I’d like to take a look at the proposal once again. Some suggested that the Yankees were fine with Eric Chavez and Andruw Jones as the DH platoon. I implied that Chavez was an injury waiting to happen and that Jones was a shell of his former self. Since then, Chavez has...wait for it...gotten injured. And Jones has been 1 for 9. If fact, Jones has been 3 for his last 20 and hasn’t had a home run since April 5th. He’s batting .231 against lefties and isn’t producing anywhere near where the Yankees had hoped. Who knows when Chavez will get back? When the article was written, Posada had had a nice couple of days in Detroit. But since then, Jorge has gone 1 for 15 with 5 strikeouts. He hasn’t had a hit vs. a lefty all season. Another criticism I got is that I quoted Posada’s BA from last year, but not his OPS+. OK, let’s take a look at Posada’s stats—all of them. Posada has struck out 26 times in 27 games. He’s batting .111 with runners in scoring position. His WAR of -0.4 is 10th worst in baseball. His K% of 28.3 is 24th in all of baseball. His BABIP of .138 is by far the worst in baseball. The next worse: Johnny Gomes with .190—52 points higher. One last geek stat: out of 580 players, www.baseballprospectus.com had Posada rated 554th in the Value Over Replacement Player. Andruw Jones was 429th. OK, you don’t think the Yankees should bring up Montero to be their full-time DH/part time catcher, then fine. So what do we do with Posada? The guy is cooked—he’s a 39-year old catcher whose body is shot. If Posada’s poor performance goes on much longer, the Yankees should be ashamed of themselves for letting one of the Core Four go out in such an embarrassing style. So who do we play as a DH? One option is to rotate the DH, with Jeter and Rodriguez getting the bulk of the days and using Nunez more, but Jeter would hate that and it would embarrass the both of them in very damaging style. Another option is the Jones—Chavez split, but as we’ve said before, Chavez is once again injured and Jones is underwhelming at best. Lastly, the Yankees could do what they always do; trade young talent for a veteran another team doesn’t want anymore. (Did you notice Mark Melancon has a 1.62 ERA?) That could work, but who could they get to fill the DH role in the middle of the Yankee lineup—I’ve heard Alfonso Soriano is for grabs? How about Carlos Lee? And whom do we surrender for the new DH? The Yankees are decidedly middle of the pack with their .252 BA. Their superior slugging has gotten them this far, but come October, the Yankees are going to also need to know how to manufacture runs as well as club the ball. To that end and for my part, bringing up Jesus Montero makes sense—the kid can just plain rake. And having him hit everyday and get accustomed to big league pitching, while easing him into the catching role slowly (playing him once a week there or so), again just makes sense. 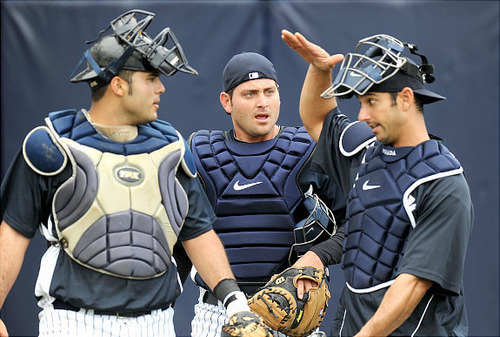 Trade Cervelli or Molina or both? Sure go ahead. Neither of them is Yogi Berra, so get what you can for them, and start grooming the kid. Anyone have better options, let’s hear them. Not too bad an idea, but they should probably give Posada a little more time while waiting to start the clock on Montereo. The Yankees need production out of the DH. There is no reason why they shouldn't give Montero a shot. He doesn't have to catch and, as you pointed out, nobody they've brought in has produced. They should rotate him in, get him some at bats and, if he doesn't produce, send him down and go get another bat via a trade.